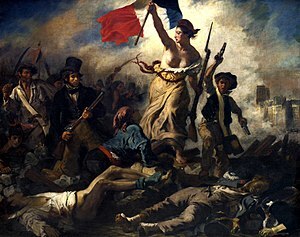 In order to stabilise the economy and finally secure public order, in the autumn of 1830 the government had the Assembly vote a cr of 5 million francs to subsidize public works, mostly roads. Then, to prevent bankruptcies and the increase of unemployment, especially in Paris, the government issued a guarantee for firms encountering difficulties, granting them 60 million francs. These subsidies mainly went into the pockets of big entrepreneurs aligned with the new regime, such as the printer Firmin Didot. Following these riots, Interior Minister Guizot requested the resignation of the prefect of the Seine, Odilon Barrot, who had criticized the parliamentarians' address to the king. Supported by Victor de Broglie, Guizot considered that an important civil servant could not criticize an act of the Chamber of Deputies, particularly when it had been approved by the King and his government. 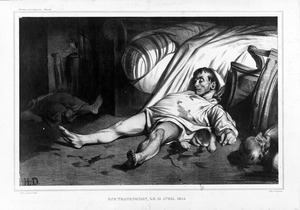 Dupont de l'Eure took Barrot's side, threatening to resign if the King disavowed him. 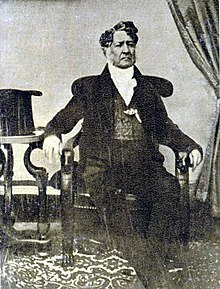 The banker Laffitte, one of the main figures of the Parti du mouvement, thereupon put himself forward to coordinate the ministers with the title of "President of the Council." This immediately led Broglie and Guizot, of the Parti de l'Ordre, to resign, followed by Casimir Perier, André Dupin, the Count Molé and Joseph-Dominique Louis. Confronted to the Parti de l'Ordre's defeat, Louis-Philippe decided to put Laffitte to trial, hoping that the exercise of power would discr him. He thus called him to form a new government on 2 November 1830. Civil unrest, however, continued, and not only in Paris. 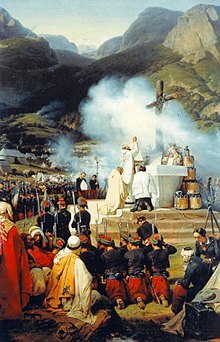 On 11 March 1832, sion exploded in Grenoble during the carnival. The prefect had canceled the festivities after a grotesque mask of Louis-Philippe had been displayed, leading to popular demonstrations. The prefect then tried to have the National Guard disperse the crowd, but the latter refused to go, forcing him to call on the army. The 35th regiment of infantry (infanterie de ligne) obeyed the orders, but this in turn led the population to demand their expulsion from the city. This was done on 15 March and the 35th regiment was replaced by the 6th regiment, from Lyon. When Casimir Perier learnt the news, he dissolved the National Guard of Grenoble and immediately recalled the 35th regiment to the city. During the parliamentary debates concerning France's imminent intervention in Belgium, several deputies, led by baron Bignon, unsuccessfully requested similar intervention to support Polish independence. However, at the domestic level, Casimir Perier decided to back down before the dominant opposition, and satisfied an old demand of the Left by abolishing herary peerages. Finally, the 2 March 1832 law on Louis-Philippe's civil list fixed it at 12 million francs a year, and one million for the Prince Royal, the duke of Orléans. The 28 April 1832 law, named after the Justice Minister Félix Barthe, reformed the 1810 Penal Code and the Code d'instruction criminelle. King Louis-Philippe was not unhappy to see Casimir Perier withdraw from the political scene, as he complained that Perier took all the cr for the government's policy successes, while he himself had to assume all the criticism for its failures. The "Citizen King" was therefore not in any hurry to find a new President of the Council, all the more since the Parliament was in recess and that the troubled situation demanded swift and energetic measures. More than 2,000 arrests were made following the riots, in particular in Paris and Lyon. The cases were referred to the Chamber of Peers, which, in accordance with art. 28 of the Charter of 1830, dealt with cases of conspiracy against state security (attentat contre la sûreté de l'État). 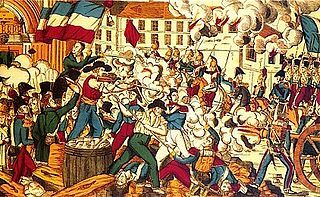 The Republican movement was decapitated, so much that even the funerals of La Fayette on 20 May 1834, were quiet. As early as 13 May the Chamber of Deputies voted a cr of 14 million in order to increase the army to 360,000 men. Two days later, they also adopted a very repressive law on detention and use of military weapons. Gérard's resignation opened up a four-month ministerial crisis, until Louis-Philippe finally assembled a government entirely from the Tiers Parti. However, after André Dupin's refusal to assume its presidency, the king made the mistake of calling, on 10 November 1834, a figure from the First Empire, the duc de Bassano, to head his government. The latter, crippled with debts, became the object of public ridicule after his crors decided to seize his ministerial salary. Alarmed, all the ministers decided to resign, three days later, without even advising Bassano, whose government became known as the "Three Days Ministry." 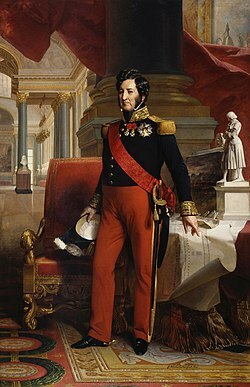 On 18 November 1834, Louis-Philippe called Marshal Mortier, duke of Trévise, to the Presidency, and the latter formed exactly the same government as Bassano. This crisis made the Tiers Parti ridiculous while the Doctrinaires triumphed. The Fieschi attentat shocked the bourgeoisie and most of France, which was generally more conservative than the people of Paris. The Republicans were discred in the country, and public opinion was ready for strong measures against them. Molé's government seemed stable, helped by the return of economic prosperity. Therefore, the king and Molé decided, against the duc d'Orléans' advice, that the moment was auspicious for the dissolving of the Chamber, which was done on 3 October 1837. In order to influence the forthcoming elections, Louis-Philippe decided on the Constantine expion in Algeria, a military success of General Valée and the duc de Nemours, second son of Louis-Philippe, who took Constantine on 13 October. Thiers also renewed the Banque de France's privilege until 1867 on such advantageous terms that the Bank had a commemorative gold medal cast. Several laws also established steamship lines, operated by companies operating state-subsidised concessions. Other laws granted crs or guarantees to railway companies in difficulties. 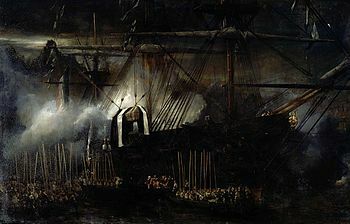 The conquest of Algeria, initiated in the last days of the Bourbon Restoration, was now confronted by Abd-el-Kader's raids, punishing Marshal Valée and the duc d'Orléans's expion to the Portes de Fer in autumn 1839, which had violated the terms of the 1837 Treaty of Tafna between General Bugeaud and Abd-el-Kader. 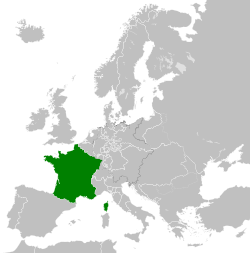 Thiers pushed in favor of colonising of the interior of the country, up to the edges of the desert. He convinced the king, who saw in Algeria an ideal theater for his son to cover the House of Orléans with glory, and persuaded him to send General Bugeaud as first governor general of Algeria. Bugeaud, who would lead harsh repression against the natives, was officially nominated on 29 December 1840, a few days after Thiers' fall. Following long negotiations between the king and Thiers, a compromise was found on 7 October 1840: France would renounce its support for Mehemet Ali's pretensions in Syria but would declare to the European powers that Egypt should remain at all costs independent. Britain thereafter recognized Mehmet Ali's herary rule on Egypt: France had obtained a return to the situation of 1832. Despite this, the rupture between Thiers and Louis-Philippe was now definitive. On 29 October 1840, when Charles de Rémusat presented to the Council of Ministers the draft of the speech of the throne, prepared by Hippolyte Passy, Louis-Philippe found it too aggressive. After a short discussion, Thiers and his associates collectively presented their resignations to the king, who accepted them. On the following day, Louis-Philippe sent for Marshal Soult and Guizot so they could return to Paris as soon as possible.